Should We Put the Extendable Leash Behind Bars? Is that were it belongs? Many people I’ve talked to would be thrilled if extendable leashes, such as the infamous Flexi, were outlawed. I gotta say, I have cursed them multiple times myself. It often seems to me that the length of the leash is inversely related to the size of the dog. The tinier the puppy, the further he is away from the human at the other end. Not only does this strike me as dangerous, it’s also really annoying for everyone else on the sidewalk. Naturally, this is a stereotype. Before I get all sorts of hate mail, I’d better correct myself. There are many wee dogs who are calm on a leash and walk beautifully beside their handlers. There are also many large dogs who tug and yank and scream at the end of a long, extendable line. It’s just the latter don’t get walked very much after their people end up in the hospital due to one too many shoulder dislocations. Speaking from personal experience, a dog can lunge and defecate regardless of the length or style of leash. We actually purchased a retractable leash for Shiva before we even brought her home. My childhood dog used one all the time so it was just another product I assumed we’d need. I thought they were better than boring old 5-foot lines. Most have more comfortable handles and they are advertised as giving dogs more freedom. How could that be a bad thing? Shiva’s reactivity quickly put an end to that line of thinking. It only took a few episodes before the line snapped and the leash sat at the bottom of a garbage can. I was just grateful said snapping happened in our backyard and not on a city street. Despite this bad experience, I am not wholly against these tools. Long lines are quite useful for those working on recalls. In the appropriate places at the appropriate times, I see nothing wrong with giving your dog wider space to roam. Many breeds – like beagles, greyhounds, and Siberian huskies – are difficult to trust off-leash. Extendable leashes enable these dogs to enjoy a run without worry. In my opinion, it would be a shame if this was no longer a possibility. We all have our biases. Most dog walkers are responsible and don’t allow their canine companions to roam aimlessly into the road or on private property. I know when I rant under my breath about the three Chihuahuas yapping at the end of their extendable leashes, that most people who walk small dogs pay much closer attention to their charges. But it still annoys me. Once more it seems to be a case of the few ruining it for everyone else. What do you think? Should municipalities place restrictions on the length of leashes? Do you think this is a problem even worth debating? ← Less Wordy Wednesday – Best. Birthday Gift. Ever. retractable leashes are frustrating. I can definitely see the benefits in some cases, but overall, I dislike them. I go for walks in a lot of isolated areas with Gwynn off-leash. He goes back on-leash if we see a dog on-leash approaching, and his recall for that is great. I don’t care if the other dog is friendly, the only way he meets another dog is on level footing. With the cord-type flexileashes… I haven’t the faintest idea if your dog is on-leash until I’ve just about tripped over it. Not to mention my paranoia about a dog trying to play with gwynn on-leash when their retracta-leash wraps around one of his legs. all it would take is for the leash to snap tight, and I’ve potentially got a hamstrung pup. I’ve also had the misfortune of nearly being taken out while biking, with that same trip-wire. At the same time -yeah, there are dogs whose owners might never be able to fully trust them off-leash, and being able to get abit more freedom is great. I think you’re right about it being the few that ruin things for the many. They have their place, but I wouldn’t be overly upset to see them eliminated in my neck of the woods. We use one for walking the paths in our yard. I would never, ever consider bringing Bella out in public on one – for her safety and mine. And I don’t have the words to express how much loathe running into dogs on them in public places. It does strike me that a lot of people who use them in public pay little to no attention to their dog and my dog ends up getting in trouble when their “friendly” dog gets snarked at for being rude to my scared-y dog. I will likely get arrested one day for speaking my mind to such folks. Have to agree with you on this one Leslie. I think around here there is a 6 foot leash requirement in most parks and probably most streets. They don’t ban a product (like a Flexi), just limit length. I have found Flexi’s helpful when airing a dog say in a field or before a dog show, but I would not use it to walk around a neighborhood or if my dog was a puller. My town does have a restriction on length of leash….no longer than 6 feet if you’re off your property. Has that stopped people who clearly have 15 foot flexis on Main Street? Not that I’ve ever seen. Of course, this goes both ways; when alone at the park, I have a nylon long line that I use. But even though we leash up with the 4 footer if we’re walking right past somebody, I’d be just as guilty as the flexi user, by letter of the law. It kind of stinks. Although this doesn’t address the city’s concerns, it is worth noting that not all long lines are Flexis. I personally really dislike Flexis after seeing some really horrific accidents caused by dogs zipping away unexpectedly (with damages to humans and canines alike.) I am, however, a big fan of plain long lines, such as those used in tracking or nosework. They give the dog freedom to run and move while giving the handler an “emergency brake.” They are less likely to snap, and a handler is more likely to be paying attention to the amount of line paid out when every inch has to be handed out. A regular long line also is less likely to clothesline the dog when he hits the end – a human can manually control the release and stop of a line far better than the mechanics of a Flexi can. I agree that it would be a shame to see dogs lose freedom to run around a bit while still on leash, but I completely understand the dangers Flexi leashes pose. Of course, any leash can be dangerous if there is a fool on either end of it – so much comes down to simple responsibility, and that is hard to legislate. I don’t know that the leashes should be outlawed but I certainly would never use one. All it takes is one incident for the leash to snap and the dog to get themselves loose. If someone wants their dog to have a longer lead they should buy a long lead, we’ve used 20 to 30 foot leads (can’t remember where we bought them) for Boomer and Dottie when we are somewhere they can explore and being on a long leash won’t cause problems for others. Pros: The dog can get a bit more freedom/range to sniff rather than being stuck in a boring near heel position all the time. Cons: Many! If you are walking by a busy street, your dog can suddenly lunge into traffic. Your dog can lunge after another dog, or heaven forbid, a child. If they build up enough of a sprint, they can pull you off your feet. (This has happened to me! Dual corgi power!) If they yank the leash out of your hand, the recoiling leash handle whacks the dog’s feet. Cord burns (I bought the model with a strap instead of a cord and that helped with the burns) from the leash wrapping around bare legs and the dog pulling away. Tangling with another dog’s leash, leading to a fight that is difficult to separate. A moment’s inattention can lead to any number of the above situations and whatever I haven’t thought of. All those negatives being what they are, I don’t think the leashes should be banned. Common sense and education are needed certainly. I would never use a flexi walking in town, agility trials ban them at the indoor facilities due to so many dogs in close quarters and obviously you can’t go to the line on a flexi, many local parks restrict you to a short leash, etc. It’s a matter of proper management, but unfortunately we can’t count on everyone to be responsible. Flexis are a nuisance, though I’m not sure regulating them would make a difference. After all, it’s an ordinance to pick up after your dog and there’s poop all over our walking areas, unfortunately. My problem with Flexi leads is that is takes away the owner’s control. In my neighborhood, many dogs are walked on Flexis, many without problems. But there’s an incident that sticks out to me as illustrative of the problem with these leashes. There’s a woman who walks her dog on a Flexi, letting the dog tear to the far end of the leash, into people’s yards, and even into the road. I walk a reactive dog and strive to avoid other dogs. We saw her coming and crossed the road. Her dog ran at the full extent of her leash into the road… nearly getting hit by an oncoming car and causing my dog to have a major freak out. Meanwhile, the owner is a dozen feet away, unable to reign in her pup. Thankfully the driver of the other vehicle reacted quickly, and I was able to move on with Lucas spinning at the end of the leash. It just makes me wonder if the risks associated with Flexis are worth the extended freedom? I don’t necessarily think they should be outlawed, but I’d love to see mandatory training for people before they can purchase one! I don’t use a flexi- but I do use a 15 foot leash when hiking or walking in the park. I am always on the alert for other people while out so I can reel her in if necessary. And I don’t use it when we are in the store or at the vet’s or any close quarters like that. I cringe every time I see a little dog on a retractable and that little dog darts into the street and the owner doesn’t seem to realize how close the dog just came to being hit by a car. It’s unbelievable! I hate Flexi’s…I’ll just say that outright. However, I own one and use it on occasion. The only time I use it is when I take Riley to the Lake or Beach and I absolutely cannot trust her off leash. Her prey drive is far too high, plus she’s not always a peach around other dogs. I don’t use it to walk down the sidewalk/street or walk at the nature trail or anything like that. I guess I hate people that use them instead of regular leads and let their dogs get waaaaay out in front of them to the end of the line and then really, what level of control can you have on a dog that’s 30 feet in front of you?? My dog is not always dog friendly, so I keep her close to me on walks…I would appreciate if you could do the same. It’s not that I don’t want the other person’s dog to enjoy freedom and nearly choking to death by running to the end of the line, I just don’t want your dog to get ahead of you around a corner and run into my dog suddenly. It won’t always end pretty. Okay, that’s enough out of me!!! Have a great weekend coming up! P.S.–Did you get my e-mail back about the Petco gift card the other week? I hadn’t heard back and was wondering. Those things annoy me to no end…but I can’t see outlawing a tool. And every once in a blue moon you see someone using them correctly. . It sounds like a lot of people are not controlling there dogs and/or leaving their waste behind. It’s THEIR fault…not the flexi’s. Just in the past week I was walking Moses and a couple with their Golden Retriever were oncoming, across the street. The Golden was on a flexi. As we got closer his interest in us increased and he bolted into the road to come greet us. The leash extended fairly far before brakes were applied and he got into the lane of traffic. Luckily this was in the Calgary suburbs with wide streets, and the car was able to swerve around. But it was very close. And the owners carried on like it was a non-event. My bias against these “tools” is strong. Often they’re not even a quality product – too many moving parts. Mostly, I think they con unknowing owners into thinking control is maintained, when it is not. 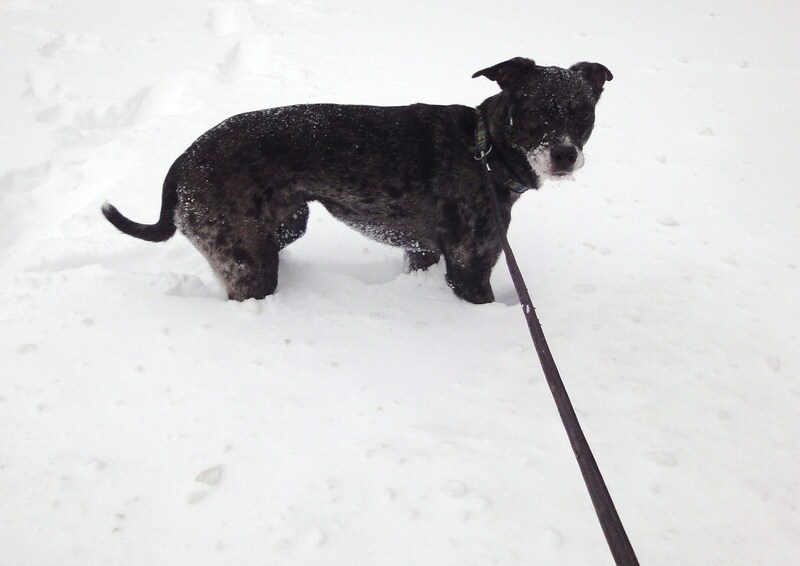 Not to mention, they are often against leash laws, when a max length is specified (like it is here – 6 feet/2 metres). Imo, it’s not the leash that’s the issue. It’s an irresponsible owner who hasn’t trained their dog to properly walk on a leash. I don’t allow my boy to go into anyone else’s yard other than my own. That’s a courtesy to my neighbors cause I definitely don’t want their dogs in mind pooping, yet they do. I agree with Brenda. Careless (or uninformed) owners will find a way to get on my nerves no matter what kind of leash they use. They’ll also allow their dogs off leash when that’s not allowed. So I don’t think banning them is a good idea, although my walking tools of choice are unretractable leashes (The Red Dingo brand has nice soft handles) attached to harnesses. I agree to a point. I have both a flexi leash and a reg. leash and I have a little dog. The problem with most little dogs on flexi’s is they have little dog syndrome, are usually not walked much to begin with, so don’t learn the rules like evey other normal dog has to “because they are small”. Having a little dog myself, I use a flexi when we are going to a park, where I let his leash extend fully, in the big open feilds. Though going to the park I lock it so he literally has to walk beside me or behind me, as that to me has been teaching him I’m in charge and manners. Also being little if you let them walk up infront of you all the time, in my knowledge that is the same thing as telling them ” your the boss, you protect me” which encourages unwanted barking, bad social skills, and bad leash skills. So obviously for the most part I use a reg. leash when walking on the sidewalk, except in special cases like the park. The reason why I can’t take my little dog off leash (I wish I could) in places like the park, is I have unfortunately run into dogs off-leash that were not friendly, well at least to little dogs, as if he wasn’t on the flexi and I had control the dog would most likely go after him (this is the owners telling me this) as in reality we try to be friendly to everyone, and I love him meeting big friendly dogs 🙂 There’s my two cents. There fore that is why I would never want them banned. We use long leads for freedom. I have had bad luck with retractable leashes. I used a Flexi leash for the first time when we were pet sitting for a friend. I definitely saw the appeal. But I always retracted the leash before we got within 10 feet of the corner and at every intersection. Our visitor, Chico, wasn’t allowed to go into people’s front yards any more than Honey was. Obviously we cleaned up. Once again, it’s just another debate about bad dog ownership. I didn’t use a long line often to work on Barbie’s recall, I just used fenced in parks and other private property, like at our local doggie daycare place. I don’t think long leashes have a place on city streets and sidewalks. I think they can be useful in parks etc with new dogs. I will always use a long line with a foster dog at the river for instance. Like every tool they need to be used responsibly. I’m not a fan of extendable leashes for a lot of reasons. You can’t “feel” your dog on the end of the line with that giant plastic handle, nor can you give subtle corrections and cues with it. I’m also not a fan of other people’s dogs rushing up on us while their owners have no control over them. If a dog runs up on us and Morgan teaches said dog the lesson they’re asking for, then Morgan would be the one in trouble. A LOT of Greyhound adoption groups make you promise not to use extendable leads in the adoption contract. Too many Greyhounds have been scared when the handle is dropped and when they run, suddenly some terrifying thing is chasing them. I have heard quite a few sad stories about them getting lost, injured and killed because of this. There’s also the fact that if that line were out all the way and they took off, they could snap their neck. Greyhounds reach top speed in three strides, and there’s enough line on an extendable leash for them to get going really fast if they decided they were going after something. To me, it’s not worth the risk. We do have an extendable, retractable leash, but it only gets used in a few specific situations, usually for photos I take outdoors in certain areas. It wouldn’t hurt my feelings one bit if they all just disappeared, though! I don’t like flexi leashes mostly because people aren’t paying attention, which is the real problem. They’re also darned hard to hold onto, so if the dog does get a good pull in, chances of you dropping the leash outright are quite high. I’m a much bigger fan of long lines. Put your dog on a real, solid, holdable long line when you’re in an appropriate place, instead of letting the dog choose how far away they should be. They should at least be banned from suburban sidewalks and busy streets and places. I can honestly say I’ve never seen a single bigdog on a retractable leash here. They are all littledogs, and the leashes are often in the hands of owners who do not know how to use them responsibly, sensibly and with awareness of other people and dogs [not to mention traffic] around them. Sometimes, worse, there is a child hanging on to the dog. Sad to say, we’ve encountered too many of these lunging, yappy dogs on unretracted leashes with unapologetic humans at the other end. It can make one very sour indeed. We walk Cali daily on a flexi lead . .always have. Usually, it’s because she is dragging behind – but I don’t think flexi leads are a good idea unless your dog is well trained on a leash. We do it so she can sniff around and take her time in the neighborhood or park, but never if we needed to control her (pet stores, vet, etc. she is on her 6′ leash). The thing I really dislike about them is that they are easy to drop and then they fly at the poor dog (and OMG, if your dog is reactive . . that would be horrible!!). It happened yesterday – I wish you could see the look on Cali’s face when it flies at her ..poor girl!! I don’t think it should be the responsibility of the municipality or city, but I do hate them most of the time. As a pet sitter, I found them dangerous and ineffective when working with a dog or walking them in a busy area. On the other hand, I didn’t mind them when in an open field or park. One of my beloved charges almost died when one he had flew out of my hand and he ran away from it as it snapped back towards him. He ran into a very busy street to get away from it. It was only luck that I got him back in time. Never used the damn things after that. Scared me half to death. I could list all the other reasons I hate them, including yapping dogs running at one of my dog aggressive clients, but I think my experience with Ernie, the dog I mentioned above, was enough to make me an anti-flexi leash person forever. I just didn’t find it safe at all. We switched to a normal lead and stuck with it ever since. I HATE flexileads! Do you know that the product safety warning for a flexilead is over 1,400 words long! The product safety warning for a Glock handgun is less than 250. They are dangerous to people and dogs. Jersey was harassed by a pair on Shih Tzus last year because their owner had two flexileads in the same hand and he dropped them when the dogs got excited. I don’t agree with really long leashes, especially on normal roads. My main worry is cars- would you be able to reign in your dog if a car swung around the corner too fast? I think most responsible dog owners realise this, but I have seen some near misses. So all in all, I believe there is a time and a place for flexi leads. Can’t use extending leads on Greyhounds as they can suddenly take off at speed and when they get to the end of the lead, they can break their necks (some Greyhound owners do use them, but they know their dogs). I use a long walking lead, which I sometimes shorten, but usually leave Polly to walk ahead of me, so long as she doesn’t pull. If Polly tries to go somewhere she shouldn’t, I immediately shorten the lead and bring her away. I always pick up after Polly, even up the farm track where a lot of other dog walkers don’t bother. i just hope it is them who walk in it. Hate flexi’s…always have always will..
Just like with many other issues related to dogs and behavior, the problem isn’t necessarily the tool…or the dog…but the human on the other end of the leash! As a dog owner, dog runner and just general runner I’ve had my fair share of issues with these though and would love to see them used less frequently! I’m not a big fan of the flexible leashes myself, only for a different reason. Should your dog lunge and somehow you lose your grip on that leash, your dog now has 1) something that is ‘chasing’ him/her 2) can be frightened by what’s ‘chasing’ them and run off on you 3) just take off. I walk Delilah on a 15 foot leash, but it’s not a retractable one. It’s just a 15 foot leash. They make them in many lengths, I’ve had 30 foot leashes, 15 foot leashes and the traditional 6 foot leash. I like this 15 foot leash and I can just as easily ‘reel’ her in when necessary as I could with the retractable leash, but with far less hassles for my part. I think they should be marketed as strictly an exercise leash, for use in a large open area with no hazards. Of course some people will still do what they please. As they say, we can’t legislate common sense. This is just like every other debate out there. It’s not the leashes fault, it’s the people on the other end. Forks don’t make people fat, guns don’t kill people, and the leashes don’t extend themselves. Sadly, people can’t be controlled, or apparently taught manners. I’ve written about this myself. We have 3 Flexis in our house, and truthfully, we could not function without them. Our yard is not fenced, so the dogs go out to do their business on the extendable leashes. In the middle of the night or on really bad weather days, it lets us stay warm in the house while the dog does whatever business needs to be done. We also use the Flexi with Howie at some dog parks. Because he is deaf, there is no recall. If we go to a dog park that does not have a small enclosed area, he goes on the extendable leash. It means he can still wander and sniff and greet other dogs without being right next to us, but it prevents him from wandering off. At the same time, it drives me crazy to see dogs being walked along city streets on the extendable leashes. We almost hit a dog that came flying off the sidewalk toward our car (at night) because it was on an extendable leash and the dog walker wasn’t paying attention. Like so many things, they can be used to great or ill effect. The answer isn’t to ban them but to educate. any product, in the wrong hands can be problematic; but I have to say that this is one dog product I would like to see off the market. Long lines/tracking lines can be used for extended work much more safely, and with much more control – and won’t amputate human fingers or choke dogs should they decide to ‘play’ with another dog. A long line and a retractable leash are different tools. Any leash longer than 6′ is not legal in the Phoenix/Scottsdale communities. Not that anybody enforces that law. Also, if you have the Canine Good Citizen, both communities allow your dog to be ‘off leash’ if under control and in a training situation. But you must have the CGC. Whoa. Nice response you’ve had here on this topic. We have one flexi leash here that I got as a review. I’ve only used it a few times and it is good for a very large area like a field or something but I would never use it as my main walking leash. I’m not sure if we have a leash law, I’d have to look into that, but I do wish flexi’s were outlawed in vet offices. I can’t stand it when someone brings their dog in on one and doesn’t have it locked. It’s so unsafe for people like me who trip over the leash and for other dogs. I just wanted to comment, that at our dog parks leashes are Not allowed, and I think it should be that way for all – because they do pose a huge problem w/tangling issues. Hm. My worst experience with the Flexi was when we had a drop kick dog (Yorkie pup) and a small Flexi. I kept the Flexi handle looped over the sliding glass door handle off the kitchen. My eight year old walked past, grabbed the clip at the end, pulled and let go. It zipped back to the handle, smacked into the glass, next thing I heard was shattering glass. We had to replace the entire door. Years ago I used one once. I borrowed a flex leash from my in-laws who have lap-sized dogs (Truly lap-size. Not the 95lb Rotty who THINKS he’s a lap dog.) to try to take my nephew’s dog 35lb Lab puppy for a walk. The nephew was ill prepared for his impromptu dog ownership and had zilch for dog equipment. Never having used one, I instinctively grabbed the line (yes line; brilliant I know) as he lunged out the door to “greet” some other people with dogs. Luckily I wasn’t cut badly across the inside of my fingers. Practice and instruction would have helped. Perhaps the line style is too dangerous for any situation though?